If all Christians receive the same Holy Spirit, why do some operate in greater levels of anointing than others-delivering powerful miracles through supernatural grace? Smith Wigglesworth was an ordinary man who walked in the continuous miracle- working power of God. He reveals that the key to manifesting God's power is understanding the one essential truth-to let God's anointing rest upon you! Through this daily devotional, Wigglesworth shares Bible secrets that will help unlock the anointing within you and show you how to operate in a greater expression of God's miraculous power! release God's anointing to bring healing, deliverance, and miracles. live a lifestyle that hosts the Holy Spirit and operates in His gifts. access the infinite resources of God within you and draw strength, power, and faith. make the supernatural natural in your everyday life. Receive revelatory insights from this respected pioneer of the miraculous. Discover how this anointing will impact your life and your world through releasing the Holy Spirit's power! 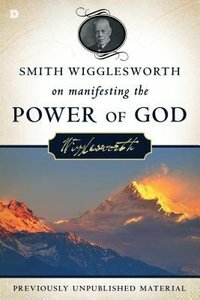 About "Smith Wigglesworth on Manifesting the Power of God"